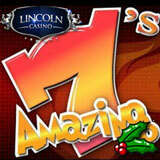 Lincoln Casino is well known for its daily, weekly and monthly-long slots tournaments. This month they've joined forced with Liberty Slots Casino to offer their biggest slots tournament prize pool ever! The $50,000 Holiday Feast Slots Tournament, being played on the popular Amazing 7s slot, will pay the winner $5000 cash, awarding a total of $50,000 in prizes. Players have until January 4th, 2015 to achieve the highest score and win the prize. In addition to the Holiday Feast, Lincoln has scheduled even more online slots tournaments than usual every day through the holiday season. Lincoln Casino welcomes players from around the world, offering over a hundred unique casino games from WGS Technology. New players can receive up to $5000 in Welcome Bonuses.